· Solving Target – Choose time of concentration. · Equations – Select one of the eight empirical equations listed in the dialog box shown above.• Unit System – English or SI unit. · Equations – Select the desired time of concentration estimation equation among the available eight methods. The table given below described these equations in further detail. · Length of Channel – Length of the longest overland flow path for the watershed in feet. · Average Watershed Slope – Average slope for the longest flow channel. · Length of Longest Channel – Length of the longest overland flow path for the watershed in miles. · Elevation Difference Between Divide and Outlet – The difference in elevation ( in feet) between the upstream end of the flow path and the outlet of the watershed. · Length of Flow Path – Length of the longest overland flow path for the watershed in feet. The product rainfall intensity and the length of flow path should be < 500. · Slope of Flow Path –Average slope for the longest flow channel. · Retardance Coefficient – Coefficient that accounts for friction effect of the channel material. Retardance factor ranges from 0.007 for smooth pavement to 0.012 for concrete and to 0.06 for dense turf. The product rainfall intensity and the length of flow path should be < 500. · Runoff Coefficient – Refers to the runoff coefficient used in rational formula. · Length of Overland Flow– Length of the longest overland flow path for the watershed. · Surface Slope – Average slope of the watershed. · Rainfall Intensity – Intensity of the design rainfall (in/hr). · Length of Overland Flow – Length of the longest overland flow path for the watershed. · Average Overland Slope – Average slope for the longest flow channel. · Manning’s Roughness Coefficient – Resistance coefficient used in Manning equation. 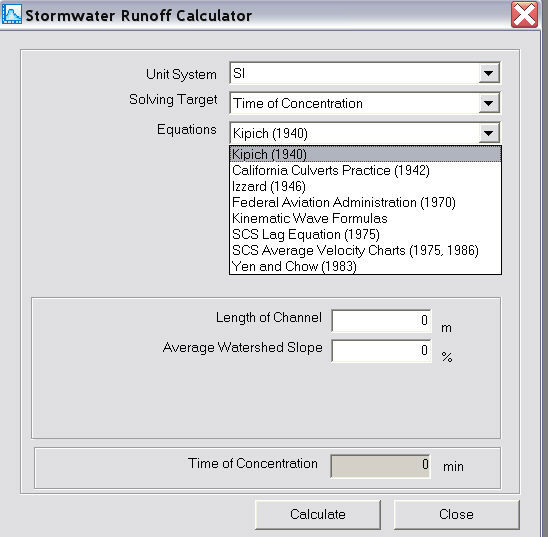 · Length of Flow Path – Intensity of the design rainfall (in/hr). · Average Watershed Slope – Average slope for the watershed. · Curve Number (CN) – NRCS curve number used as an index of the watershed’s runoff generation potential. · Length vs Velocity Chart – Specify average flow velocity for various channel lengths. · Length of Flow – Length of the longest overland flow path for the watershed in feet. · Average Watershed Slope – Average slope for the watershed..
· Overland Texture Factor – Overland texture factor. See Table 3.13. · Time of Concentration – The time it takes for flow to travel from the hydraulically remotest point in the watershed to reach outlet of the watershed.